Passengers board the Madaraka Express train at the Nairobi terminus (file photo). Public transport in Nairobi is set for a major makeover with the planned roll-out of commuter trains in the next few months. The transformation of the capital's commuter railway system will include improvement of the existing infrastructure, coaches, safety and security, access and number of trips. Already, construction of five new stations in Ruiru, Kikuyu, Mwiki, Kahawa and Dandora has been completed. Housing and Urban Development Principal Secretary Charles Hinga said that this is aimed at reorganising the once-neglected sector to woo middle class Nairobians to use public transport. Also included in the plan are high-capacity buses for the bus rapid transit (BRT) system. The PS said the government is aiming for a long-term solution for perennial congestion within city roads. Known for its old coaches, overcrowding and chaos, the commuter railway in Nairobi has for long been associated with the poor. But, with the newly constructed railway stations which come with parking lots for motorists and fully equipped police stations, it is hoped that insecurity and chaos will be a thing of the past. "Since we target mass transport we also plan to improve the frequency of the trains serving various routes," said Mr Hinga, adding that the commuter railway service will soon be the bedrock of the city's public transport. The initiative to reorganise the city transport is being undertaken by Nairobi Metropolitan Services Improvement Project (NaMSIP) and the ministry of Lands, Housing and Urban Development with funding from the World Bank. The World Bank has financed NaMSIP projects to the tune of 300 million USD over the last six years. 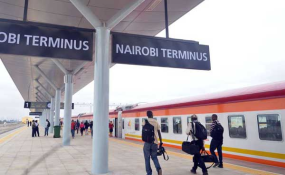 World Bank country director Felipe Jaramillo, who reiterated that Nairobi urban transport needed an urgent upgrade, said that Nairobians spend too much time in transit. "Traffic congestion is a big problem in Nairobi. It is an unfortunate waste of time and cause for inefficiency," said Mr Jaramillo. He added that the use of rail to decongest the city is a noble idea. He revealed that the World Bank financed construction of the first 10 stations.